DEMEROL Injection exposes patients and other users to the risks of opioid addiction, abuse, and misuse, which can lead to overdose and death. Assess each patient's risk prior to prescribing DEMEROL Injection, and monitor all patients regularly for the development of these behaviors and conditions [see Warnings and Precautions (5.1)]. 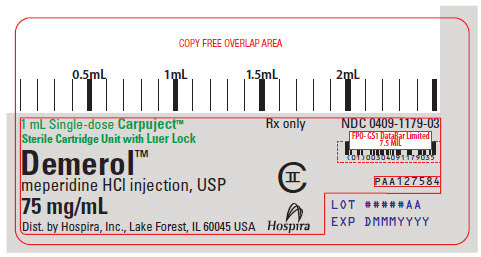 Serious, life-threatening, or fatal respiratory depression may occur with use of DEMEROL Injection. 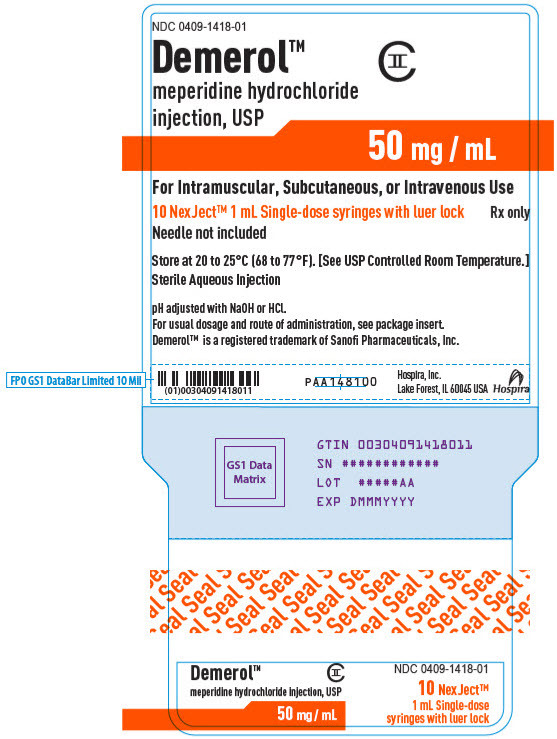 Monitor for respiratory depression, especially during initiation of DEMEROL Injection or following a dose increase [see Warnings and Precautions (5.2)]. 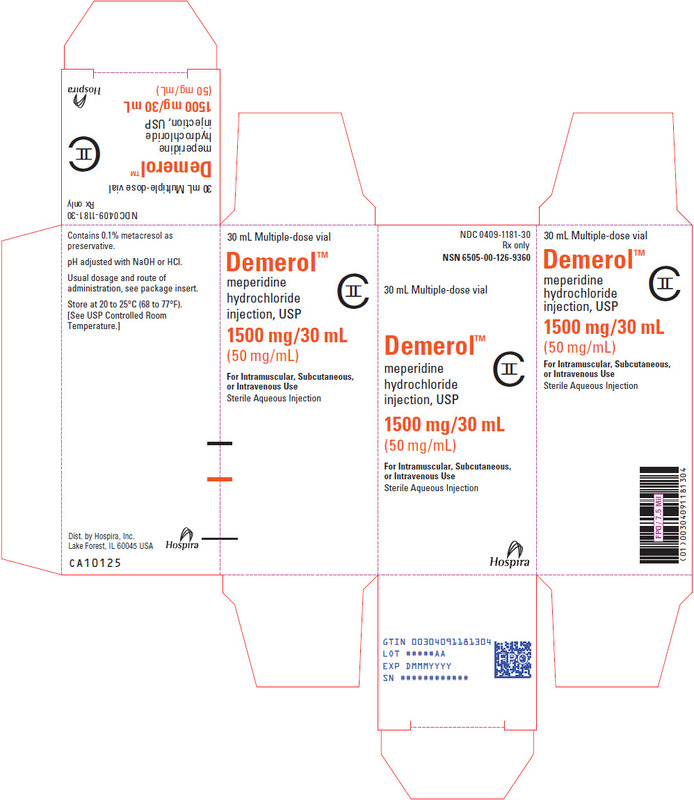 Prolonged use of DEMEROL Injection during pregnancy can result in neonatal opioid withdrawal syndrome, which may be life-threatening if not recognized and treated, and requires management according to protocols developed by neonatology experts. If opioid use is required for a prolonged period in a pregnant woman, advise the patient of the risk of neonatal opioid withdrawal syndrome and ensure that appropriate treatment will be available [see Warnings and Precautions (5.3)]. The concomitant use of DEMEROL Injection with all cytochrome P450 3A4 inhibitors may result in an increase in meperidine plasma concentrations, which could increase or prolong adverse reactions and may cause potentially fatal respiratory depression. In addition, discontinuation of a concomitantly used cytochrome P450 3A4 inducer may result in an increase in meperidine plasma concentration. Monitor patients receiving DEMEROL Injection and any CYP3A4 inhibitor or inducer [see Warnings and Precautions (5.4), Drug Interactions (7)]. Reserve concomitant prescribing of DEMEROL Injection and benzodiazepines or other CNS depressants for use in patients for whom alternative treatment options are inadequate. Limit dosage and duration to the minimum required. Concomitant use of DEMEROL Injection with monoamine oxidase (MAO) inhibitors can result in coma, severe respiratory depression, cyanosis, and hypotension. Use of DEMEROL Injection with MAO inhibitors within last 14 days is contraindicated [see Contraindications (4), Warnings and Precautions (5.6), Drug Interactions (7)]. These highlights do not include all the information needed to use DEMEROLâ„¢ INJECTION safely and effectively. 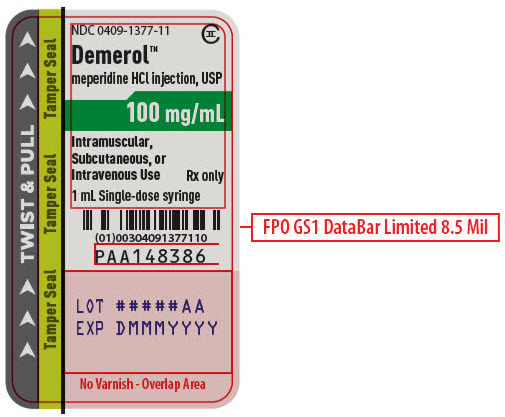 See full prescribing information for DEMEROL INJECTION. Concomitant use of opioids with benzodiazepines or other central nervous system (CNS) depressants, including alcohol, may result in profound sedation, respiratory depression, coma, and death. Reserve concomitant prescribing for use in patients for whom alternative treatment options are inadequate; limit dosages and durations to the minimum required; and follow patients for signs and symptoms of respiratory depression and sedation. (5.5, 7). DEMEROL Injection is indicated for preoperative medication, support of anesthesia, and obstetrical analgesia. 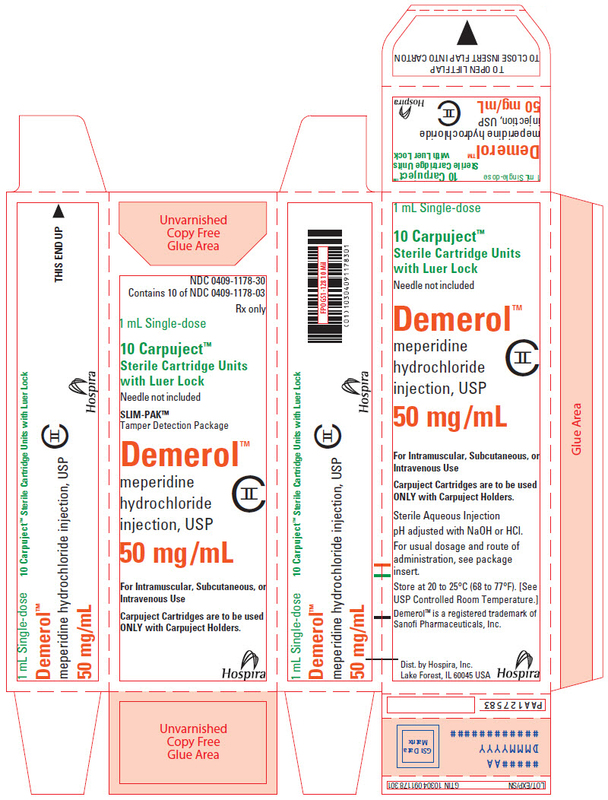 DEMEROL Injection is indicated for the management of pain severe enough to require an opioid analgesic and for which alternative treatments are inadequate. DEMEROL Injection should not be used for treatment of chronic pain. Prolonged DEMEROL Injection use may increase the risk of toxicity (e.g. seizures) from the accumulation of the meperidine metabolite, normeperidine. Monitor patients closely for respiratory depression, especially within the first 24â€“72 hours of initiating therapy and following dosage increases with DEMEROL Injection and adjust the dosage accordingly [see Warnings and Precautions (5.2)]. Parenteral drug products should be inspected visually for particulate and discoloration prior to administration whenever solution and container permit. Dosage should be adjusted according to the severity of the pain and the response of the patient. While subcutaneous administration is suitable for occasional use, intramuscular administration is preferred when repeated doses are required. If intravenous administration is required, dosage should be decreased and the injection made very slowly, preferably utilizing a diluted solution. Adults: The usual dosage is 50 mg to 150 mg intramuscularly or subcutaneously every 3 or 4 hours as needed for pain. Elderly patients should usually be given meperidine at the lower end of the dose range and observed closely. Children: The usual dosage is 0.5 mg/lb to 0.8 mg/lb intramuscularly or subcutaneously up to the adult dose, every 3 or 4 hours as necessary. Individually titrate DEMEROL Injection to a dose that provides adequate analgesia and minimizes adverse reactions. Continually reevaluate patients receiving DEMEROL Injection to assess the maintenance of pain control and the relative incidence of adverse reactions, as well as monitoring for the development of addiction, abuse, or misuse [see Warnings and Precautions (5.1)]. Frequent communication is important among the prescriber, other members of the health and care team, the patient, and the caregiver/family during periods of changing analgesic requirements, including initial titration. If the level of pain increases after dosage stabilization, attempt to identify the source of increased pain before increasing the DEMEROL Injection dosage. If unacceptable opioid-related adverse reactions are observed, consider reducing the dosage. Adjust the dosage to obtain an appropriate balance between management of pain and opioid-related adverse reactions. When a patient who has been taking DEMEROL Injection regularly and may be physically dependent no longer requires therapy with DEMEROL Injection, taper the dose gradually, by 25% to 50% every 2 to 4 days, while monitoring carefully for signs and symptoms of withdrawal. If the patient develops these signs or symptoms, raise the dose to the previous level and taper more slowly, either by increasing the interval between decreases, decreasing the amount of change in dose, or both. 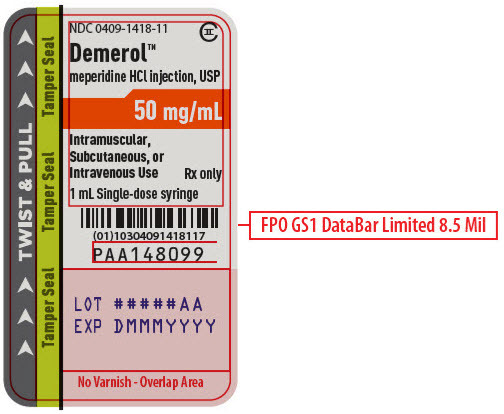 Do not abruptly discontinue DEMEROL Injection in a physically-dependent patient [see Warnings and Precautions (5.13), Drug Abuse and Dependence (9.3)]. Adults: The usual dosage is 50 mg to 100 mg intramuscularly or subcutaneously, 30 to 90 minutes before the beginning of anesthesia. Elderly patients should usually be given meperidine at the lower end of the dose range and observed closely. Children: The usual dosage is 0.5 mg/lb to 1 mg/lb intramuscularly or subcutaneously up to the adult dose, 30 to 90 minutes before the beginning of anesthesia. 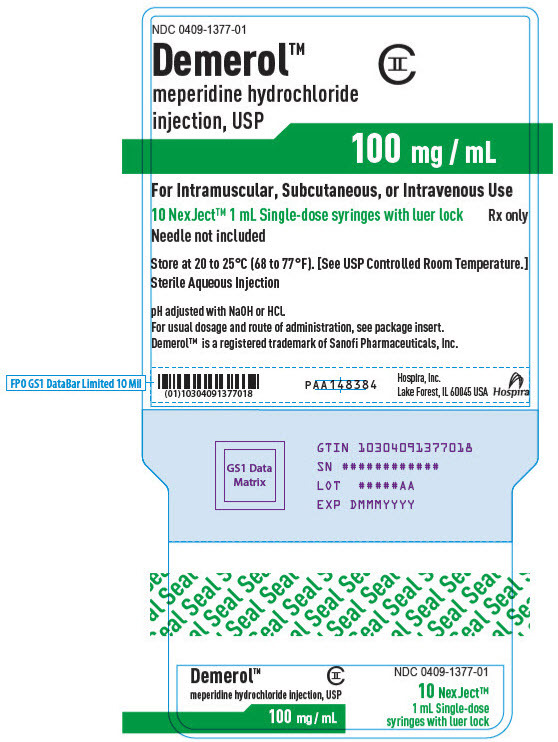 Repeated slow intravenous Injections of fractional doses (e.g., 10 mg/mL) or continuous intravenous infusion of a more dilute solution (e.g., 1 mg/mL) should be used. The dose should be titrated to the needs of the patient and will depend on the premedication and type of anesthesia being employed, the characteristics of the particular patient, and the nature and duration of the operative procedure. Elderly patients should usually be given meperidine at the lower end of the dose range and observed closely. The usual dosage is 50 mg to 100 mg intramuscularly or subcutaneously when pain becomes regular, and may be repeated at 1- to 3-hour intervals. The dose of DEMEROL Injection should be proportionately reduced (usually by 25 to 50 percent) when administered concomitantly with phenothiazines and many other tranquilizers since they potentiate the action of DEMEROL Injection. Instructions for using the Carpuject Syringe are available with the reusable Carpuject Holder. 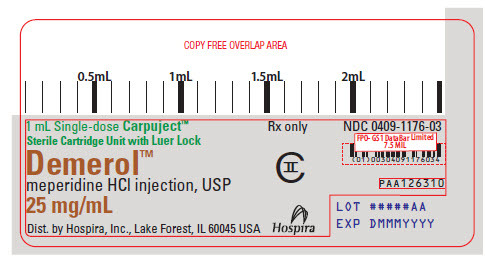 Carpuject Single-dose cartridges are to be used ONLY with Carpuject Holders. To prevent needlestick injuries, needles should not be recapped, purposely bent, or broken by hand. Blunt cannulas should not be recapped, purposely bent or broken by hand. Injectable, Carpuject Single-dose cartridge with Luer Lock for the Carpuject Syringe System: 25 mg/mL, 50 mg/mL, 75 mg/mL, and 100 mg/mL. Injectable, multiple-dose vials: 1,500 mg/30 mL (50 mg/mL) and 2,000 mg/20 mL (100 mg/mL), containing 0.1% metacresol as a preservative. 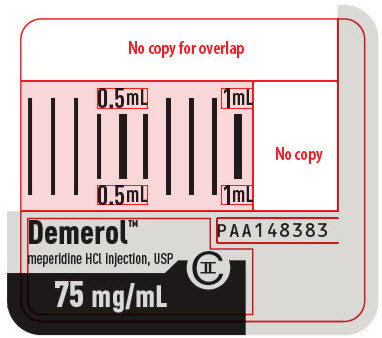 DEMEROL Injection contains meperidine, a Schedule II controlled substance. As an opioid, DEMEROL Injection exposes users to the risks of addiction, abuse, and misuse [see Drug Abuse and Dependence (9)]. Although the risk of addiction in any individual is unknown, it can occur in patients appropriately prescribed DEMEROL Injection. Addiction can occur at recommended dosages and if the drug is misused or abused. Assess each patient's risk for opioid addiction, abuse, or misuse prior to prescribing DEMEROL Injection, and monitor all patients receiving DEMEROL Injection for the development of these behaviors and conditions. Risks are increased in patients with a personal or family history of substance abuse (including drug or alcohol abuse or addiction) or mental illness (e.g., major depression). The potential for these risks should not, however, prevent the proper management of pain in any given patient. Patients at increased risk may be prescribed opioids such as DEMEROL Injection, but use in such patients necessitates intensive counseling about the risks and proper use of DEMEROL Injection along with intensive monitoring for signs of addiction, abuse, and misuse. Opioids are sought by drug abusers and people with addiction disorders and are subject to criminal diversion. Consider these risks when prescribing or dispensing DEMEROL Injection. Strategies to reduce these risks include prescribing the drug in the smallest appropriate quantity. 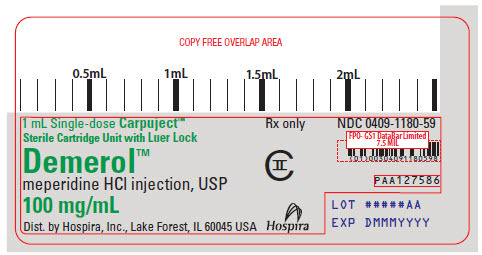 While serious, life-threatening, or fatal respiratory depression can occur at any time during the use of DEMEROL Injection, the risk is greatest during the initiation of therapy or following a dosage increase. Monitor patients closely for respiratory depression, especially within the first 24 to 72 hours of initiating therapy with and following dosage increases of DEMEROL Injection. To reduce the risk of respiratory depression, proper dosing and titration of DEMEROL Injection are essential [see Dosage and Administration (2.3)]. Overestimating the DEMEROL Injection dosage when converting patients from another opioid product can result in a fatal overdose with the first dose. Prolonged use of DEMEROL Injection during pregnancy can result in withdrawal in the neonate. Neonatal opioid withdrawal syndrome, unlike opioid withdrawal syndrome in adults, may be life-threatening if not recognized and treated, and requires management according to protocols developed by neonatology experts. Observe newborns for signs of neonatal opioid withdrawal syndrome and manage accordingly. Advise pregnant women using opioids of neonatal opioid withdrawal syndrome and ensure that appropriate treatment will be available [see Use in Specific Populations (8.1), Patient Counseling Information (17)]. Concomitant use of DEMEROL Injection with a CYP3A4 inhibitor, such as macrolide antibiotics (e.g., erythromycin), azole-antifungal agents (e.g., ketoconazole), and protease inhibitors (e.g., ritonavir), may increase plasma concentrations of meperidine and prolong opioid adverse reactions, which may cause potentially fatal respiratory depression [see Warnings and Precautions (5.4)], particularly when an inhibitor is added after a stable dose of DEMEROL Injection is achieved. Similarly, discontinuation of a CYP3A4 inducer, such as rifampin, carbamazepine, and phenytoin, in DEMEROL-Injection treated patients may increase meperidine plasma concentrations and prolong opioid adverse reactions. When using DEMEROL Injection with CYP3A4 inhibitors or discontinuing CYP3A4 inducers in DEMEROL-Injection treated patients, monitor patients closely at frequent intervals and consider dosage reduction of DEMEROL Injection until stable drug effects are achieved [Drug Interactions (7)]. Concomitant use of DEMEROL Injection with CYP3A4 inducers or discontinuation of a CYP3A4 inhibitor could decrease meperidine plasma concentrations, decrease opioid efficacy or, possibly, lead to a withdrawal syndrome in a patient who had developed physical dependence to meperidine. 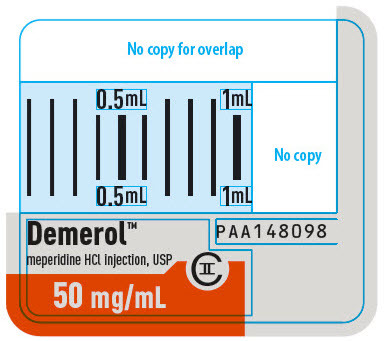 When using DEMEROL Injection with CYP3A4 inducers or discontinuing CYP3A4 inhibitors, monitor patients closely at frequent intervals and consider increasing the opioid dosage if needed to maintain adequate analgesia or if symptoms of opioid withdrawal occur [see Drug Interactions (7)]. Profound sedation, respiratory depression, coma, and death may result from the concomitant use of DEMEROL Injection with benzodiazepines or other CNS depressants (e.g., non-benzodiazepine sedatives/hypnotics, anxiolytics, tranquilizers, muscle relaxants, general anesthetics, antipsychotics, other opioids, alcohol). Because of these risks, reserve concomitant prescribing of these drugs for use in patients for whom alternative treatment options are inadequate. Advise both patients and caregivers about the risks of respiratory depression and sedation when DEMEROL Injection is used with benzodiazepines or other CNS depressants (including alcohol and illicit drugs). Advise patients not to drive or operate heavy machinery until the effects of concomitant use of the benzodiazepine or other CNS depressant have been determined. Screen patients for risk of substance use disorders, including opioid abuse and misuse, and warn them of the risk for overdose and death associated with the use of additional CNS depressants including alcohol and illicit drugs [see Drug Interactions (7), Patient Counseling Information (17)]. Meperidine is contraindicated in patients who are receiving monoamine oxidase (MAO) inhibitors or those who have recently received such agents. Therapeutic doses of meperidine have occasionally precipitated unpredictable, severe, and occasionally fatal reactions in patients who have received such agents within 14 days. The mechanism of these reactions is unclear, but may be related to a preexisting hyperphenylalaninemia. Some have been characterized by coma, severe respiratory depression, cyanosis, and hypotension, and have resembled the syndrome of acute narcotic overdose. Serotonin syndrome with agitation, hyperthermia, diarrhea, tachycardia, sweating, tremors and impaired consciousness may also occur. In other reactions the predominant manifestations have been hyperexcitability, convulsions, tachycardia, hyperpyrexia, and hypertension. Do not use DEMEROL Injection in patients taking MAOIs or within 14 days of stopping such treatment. Intravenous hydrocortisone or prednisolone have been used to treat severe reactions, with the addition of intravenous chlorpromazine in those cases exhibiting hypertension and hyperpyrexia. The usefulness and safety of narcotic antagonists in the treatment of these reactions is unknown. The use of DEMEROL Injection in patients with acute or severe bronchial asthma in an unmonitored setting or in the absence of resuscitative equipment is contraindicated. Patients with Chronic Pulmonary Disease: DEMEROL-Injection treated patients with significant chronic obstructive pulmonary disease or cor pulmonale, and those with a substantially decreased respiratory reserve, hypoxia, hypercapnia, or pre-existing respiratory depression are at increased risk of decreased respiratory drive including apnea, even at recommended dosages of DEMEROL Injection [see Warnings and Precautions (5.2)]. Monitor such patients closely, particularly when initiating and titrating DEMEROL Injection and when DEMEROL Injection is given concomitantly with other drugs that depress respiration [see Warnings and Precautions (5.2)]. Alternatively, consider the use of non-opioid analgesics in these patients. Cases of serotonin syndrome, a potentially life-threatening condition, have been reported during concomitant use of DEMEROL Injection with serotonergic drugs. Serotonergic drugs include selective serotonin reuptake inhibitors (SSRIs), serotonin and norepinephrine reuptake inhibitors (SNRIs), tricyclic antidepressants (TCAs), triptans, 5-HT3 receptor antagonists, drugs that affect the serotonergic neurotransmitter system (e.g., mirtazapine, trazodone, tramadol), and drugs that impair metabolism of serotonin (including MAO inhibitors, both those intended to treat psychiatric disorders and also others, such as linezolid and intravenous methylene blue) [see Drug Interactions (7)]. This may occur within the recommended dosage range. Serotonin syndrome symptoms may include mental status changes (e.g., agitation, hallucinations, coma), autonomic instability (e.g., tachycardia, labile blood pressure, hyperthermia), neuromuscular aberrations (e.g., hyperreflexia, incoordination, rigidity), and/or gastrointestinal symptoms (e.g., nausea, vomiting, diarrhea). The onset of symptoms generally occurs within several hours to a few days of concomitant use, but may occur later than that. Discontinue DEMEROL Injection if serotonin syndrome is suspected. DEMEROL Injection may cause severe hypotension including orthostatic hypotension and syncope in ambulatory patients. There is increased risk in patients whose ability to maintain blood pressure has already been compromised by a reduced blood volume or concurrent administration of certain CNS depressant drugs (e.g., phenothiazines or general anesthetics) [see Drug Interactions (7)]. Monitor these patients for signs of hypotension after initiating or titrating the dosage of DEMEROL Injection. In patients with circulatory shock, DEMEROL Injection may cause vasodilation that can further reduce cardiac output and blood pressure. Avoid the use of DEMEROL Injection in patients with circulatory shock. In patients who may be susceptible to the intracranial effects of CO2 retention (e.g., those with evidence of increased intracranial pressure or brain tumors), DEMEROL Injection may reduce respiratory drive, and the resultant CO2 retention can further increase intracranial pressure. Monitor such patients for signs of sedation and respiratory depression, particularly when initiating therapy with DEMEROL Injection. Opioids may also obscure the clinical course in a patient with a head injury. Avoid the use of DEMEROL Injection in patients with impaired consciousness or coma. 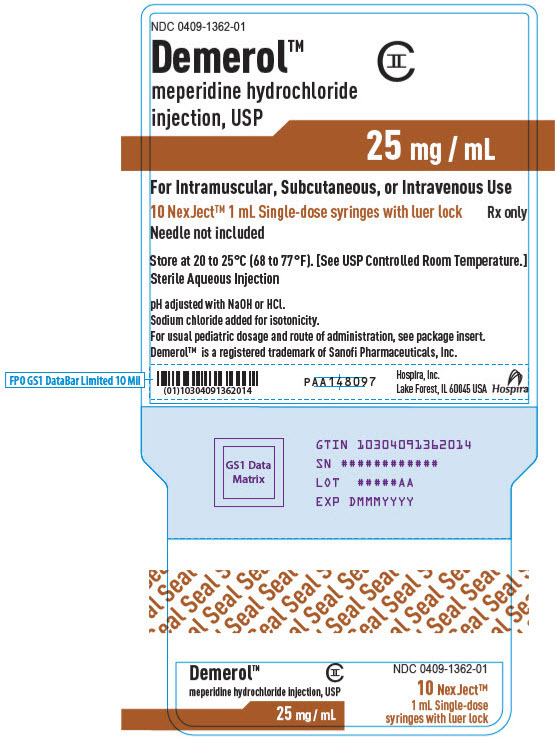 DEMEROL Injection is contraindicated in patients with known or suspected gastrointestinal obstruction, including paralytic ileus. The meperidine in DEMEROL Injection may cause spasm of the sphincter of Oddi. Opioids may cause increases in serum amylase. Monitor patients with biliary tract disease, including acute pancreatitis, for worsening symptoms. The meperidine in DEMEROL Injection may increase the frequency of seizures in patients with seizure disorders, and may increase the risk of seizures occurring in other clinical settings associated with seizures. Monitor patients with a history of seizure disorders for worsened seizure control during DEMEROL Injection therapy. Prolonged meperidine use may increase the risk of toxicity (e.g., seizures) from the accumulation of the meperidine metabolite, normeperidine. Avoid the use of mixed agonist/antagonist (e.g., pentazocine, nalbuphine, and butorphanol) or partial agonist (e.g., buprenorphine) analgesics in patients who are receiving a full opioid agonist analgesic, including DEMEROL Injection. In these patients, mixed agonist/antagonist and partial agonist analgesics may reduce the analgesic effect and/or precipitate withdrawal symptoms. When discontinuing DEMEROL Injection, gradually taper the dosage [see Dosage and Administration (2.4)]. Do not abruptly discontinue DEMEROL Injection [see Drug Abuse and Dependence (9.3)]. 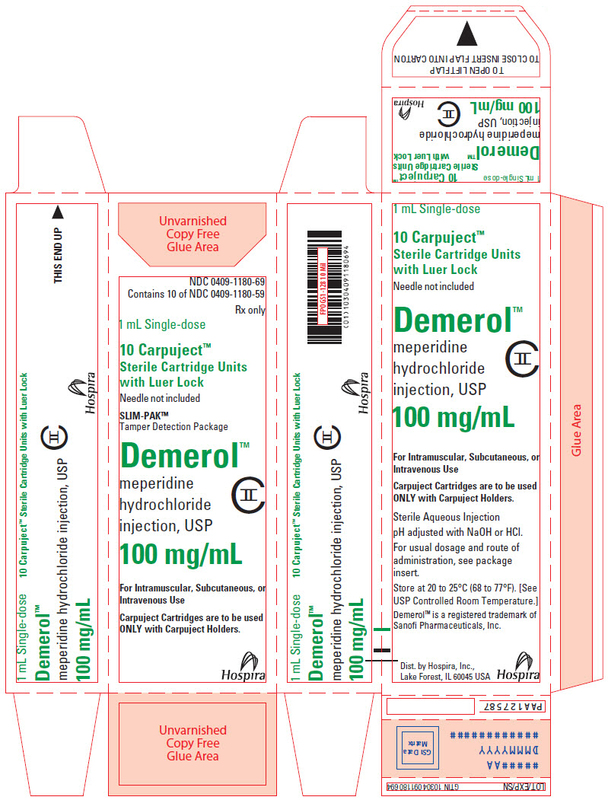 DEMEROL Injection may impair the mental or physical abilities needed to perform potentially hazardous activities such as driving a car or operating machinery. Warn patients not to drive or operate dangerous machinery unless they are tolerant to the effects of DEMEROL Injection and know how they will react to the medication. 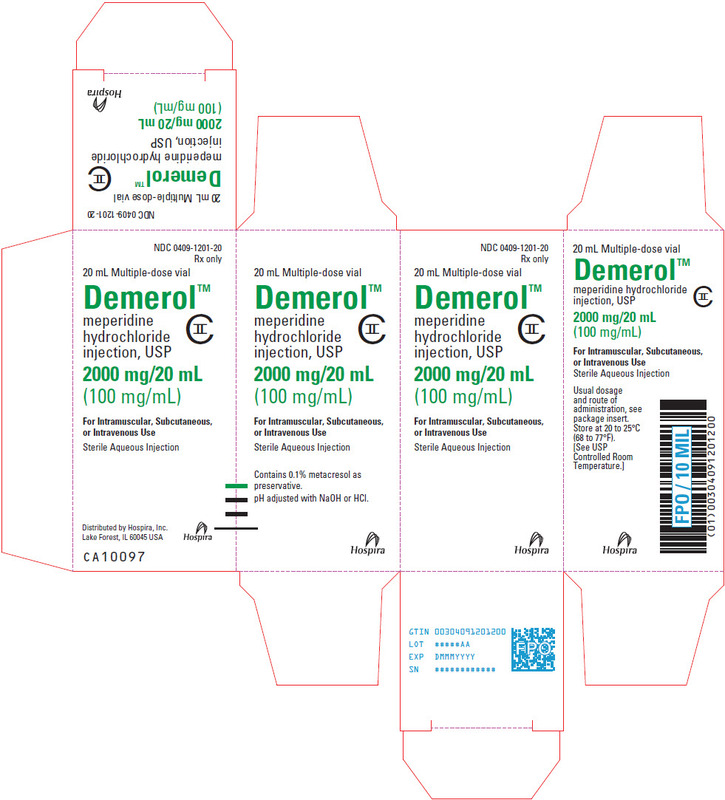 DEMEROL Injection should be used with caution in patients with atrial flutter and other supraventricular tachycardias because of a possible vagolytic action which may produce a significant increase in the ventricular response rate. If necessary, meperidine may be given intravenously, but the injection should be given very slowly, preferably in the form of a diluted solution. Rapid intravenous injection of narcotic analgesics, including meperidine, increases the incidence of adverse reactions; severe respiratory depression, apnea, hypotension, peripheral circulatory collapse, and cardiac arrest have occurred. Meperidine should not be administered intravenously unless a narcotic antagonist and the facilities for assisted or controlled respiration are immediately available. When meperidine is given parenterally, especially intravenously, the patient should be lying down. The following adverse reactions associated with the use of meperidine were identified in clinical studies or postmarketing reports. Because some of these reactions were reported voluntarily from a population of uncertain size, it is not always possible to reliably estimate their frequency or establish a causal relationship to drug exposure. The major hazards of meperidine, as with other opioid analgesics, are respiratory depression and, to a lesser degree, circulatory depression; respiratory arrest, shock, and cardiac arrest have occurred. The most frequently observed adverse reactions include lightheadedness, dizziness, sedation, nausea, vomiting, and sweating. These effects seem to be more prominent in ambulatory patients and in those who are not experiencing severe pain. In such individuals, lower doses are advisable. Some adverse reactions in ambulatory patients may be alleviated if the patient lies down. Nervous System. Mood changes (e.g. euphoria, dysphoria), weakness, headache, agitation, tremor, involuntary muscle movements (e.g. muscle twitches, myoclonus), severe convulsions, transient hallucinations and disorientation, confusion, delirium, visual disturbances. Inadvertent injection about a nerve trunk may result in sensory-motor paralysis which is usually, though not always, transitory. Gastrointestinal. Dry mouth, constipation, biliary tract spasm. Cardiovascular. Flushing of the face, tachycardia, bradycardia, palpitation, hypotension [see Warnings and Precautions (5.17)], syncope, phlebitis following intravenous injection. Allergic. Pruritus, urticaria, other skin rashes, wheal and flare over the vein with intravenous injection. Histamine release leading to hypotension and/or tachycardia, flushing, sweating, and pruritus. Other. Pain at injection site; local tissue irritation and induration following subcutaneous injection, particularly when repeated; antidiuretic effect. Table 1 includes clinically significant drug interactions with DEMEROL Injection. Clinical Impact: Meperidine is contraindicated in patients who are receiving monoamine oxidase (MAO) inhibitors or those who have recently received such agents. Therapeutic doses of meperidine have occasionally precipitated unpredictable, severe, and occasionally fatal reactions in patients who have received such agents within 14 days. The mechanism of these reactions is unclear, but may be related to a preexisting hyperphenylalaninemia. Some have been characterized by coma, severe respiratory depression, cyanosis, and hypotension, and have resembled the syndrome of acute narcotic overdose. Serotonin syndrome with agitation, hyperthermia, diarrhea, tachycardia, sweating, tremors and impaired consciousness may also occur. In other reactions the predominant manifestations have been hyperexcitability, convulsions, tachycardia, hyperpyrexia, and hypertension. Intervention: Do not use DEMEROL Injection in patients taking MAOIs or within 14 days of stopping such treatment. Intravenous hydrocortisone or prednisolone have been used to treat severe reactions, with the addition of intravenous chlorpromazine in those cases exhibiting hypertension and hyperpyrexia. The usefulness and safety of narcotic antagonists in the treatment of these reactions is unknown. Clinical Impact: The concomitant use of DEMEROL Injection and CYP3A4 or CYP2B6 inhibitors can increase the plasma concentration of meperidine, resulting in increased or prolonged opioid effects. These effects could be more pronounced with concomitant use of DEMEROL Injection and CYP2B6 and CYP3A4 inhibitors, particularly when an inhibitor is added after a stable dose of DEMEROL Injection is achieved [see Warnings and Precautions (5.4)]. After stopping a CYP3A4 inhibitor, as the effects of the inhibitor decline, the meperidine plasma concentration will decrease [see Clinical Pharmacology (12.3)], resulting in decreased opioid efficacy or a withdrawal syndrome in patients who had developed physical dependence to meperidine. Intervention: If concomitant use is necessary, consider dosage reduction of DEMEROL Injection until stable drug effects are achieved. Monitor patients for respiratory depression and sedation at frequent intervals. If a CYP3A4 or CYP2B6 inhibitor is discontinued, consider increasing the DEMEROL Injection dosage until stable drug effects are achieved. Monitor for signs of opioid withdrawal. Clinical Impact: The concomitant use of DEMEROL Injection and CYP3A4 inducers, or CYP2B6 inducers can decrease the plasma concentration of meperidine [see Clinical Pharmacology (12.3)], resulting in decreased efficacy or onset of a withdrawal syndrome in patients who have developed physical dependence to meperidine [see Warnings and Precautions (5.4)]. After stopping a CYP3A4 or CYP2B6 inducer, as the effects of the inducer decline, the meperidine plasma concentration will increase [see Clinical Pharmacology (12.3)], which could increase or prolong both the therapeutic effects and adverse reactions, and may cause serious respiratory depression. Intervention: If concomitant use is necessary, consider increasing the DEMEROL Injection dosage until stable drug effects are achieved. Monitor for signs of opioid withdrawal. If a CYP3A4 or CYP2B6 inducer is discontinued, consider DEMEROL Injection dosage reduction and monitor for signs of respiratory depression. Clinical Impact: Due to additive pharmacologic effect, the concomitant use of benzodiazepines or other CNS depressants, including alcohol, can increase the risk of hypotension respiratory depression, profound sedation, coma, and death. Clinical Impact: The concomitant use of opioids with other drugs that affect the serotonergic neurotransmitter system has resulted in serotonin syndrome [see Warnings and Precautions (5.7)]. Intervention: If concomitant use is warranted, carefully observe the patient, particularly during treatment initiation and dose adjustment. Discontinue DEMEROL Injection if serotonin syndrome is suspected. Clinical Impact: May reduce the analgesic effect of DEMEROL Injection and/or precipitate withdrawal symptoms. Clinical Impact: Meperidine may enhance the neuromuscular blocking action of skeletal muscle relaxants and produce an increased degree of respiratory depression. Intervention: Monitor patients for signs of respiratory depression that may be greater than otherwise expected and decrease the dosage of DEMEROL Injection and/or the muscle relaxant as necessary. Intervention: Monitor patients for signs of urinary retention or reduced gastric motility when DEMEROL Injection is used concomitantly with anticholinergic drugs. Clinical Impact: The concomitant use of acyclovir may increase the plasma concentrations of meperidine and its metabolite, normeperidine. Intervention: If concomitant use of acyclovir and DEMEROL Injection is necessary, monitor patients for respiratory depression and sedation at frequent intervals. Intervention: If concomitant use cimetidine and DEMEROL Injection is necessary, monitor patients for respiratory depression and sedation at frequent intervals. Adverse outcomes in pregnancy can occur regardless of the health of the mother or the use of medications. In the U.S. general population, the estimated background risk of major birth defects and miscarriage in clinically recognized pregnancies is 2â€“4% and 15â€“20%, respectively. Neonatal opioid withdrawal syndrome presents as irritability, hyperactivity and abnormal sleep pattern, high pitched cry, tremor, vomiting, diarrhea, and failure to gain weight. The onset, duration, and severity of neonatal opioid withdrawal syndrome vary based on the specific opioid used, duration of use, timing and amount of last maternal use, and rate of elimination of the drug by the newborn. Observe newborns for symptoms of neonatal opioid withdrawal syndrome and manage accordingly [see Warnings and Precautions (5.3)]. Opioids cross the placenta and may produce respiratory depression and psycho-physiologic effects in neonates. An opioid antagonist, such as naloxone, must be available for reversal of opioid-induced respiratory depression in the neonate. DEMEROL Injection is not recommended for use in pregnant women during or immediately prior to labor, when other analgesic techniques are more appropriate. Opioid analgesics, including DEMEROL Injection, can prolong labor through actions which temporarily reduce the strength, duration, and frequency of uterine contractions. However, this effect is not consistent and may be offset by an increased rate of cervical dilation, which tends to shorten labor. Monitor neonates exposed to opioid analgesics during labor for signs of excess sedation and respiratory depression. Formal reproductive and developmental toxicology studies for meperidine have not been completed. In a published study, neural tube defects (exencephaly and cranioschisis) were noted following subcutaneous administration of meperidine hydrochloride (127 and 218 mg/kg, respectively) on Gestation Day 8 to pregnant hamsters (0.85 and 1.5 times the total daily dose of 1200 mg/day based on body surface area). The findings cannot be clearly attributed to maternal toxicity. Meperidine appears in the milk of nursing mothers receiving the drug. The developmental and health benefits of breastfeeding should be considered along with the mother's clinical need for DEMEROL Injection and any potential adverse effects on the breastfed infant from DEMEROL Injection or from the underlying maternal condition. Infants exposed to DEMEROL Injection through breast milk should be monitored for excess sedation and respiratory depression. Withdrawal symptoms can occur in breastfed infants when maternal administration of an opioid analgesic is stopped, or when breast-feeding is stopped. Chronic use of opioids may cause reduced fertility in females and males of reproductive potential. It is not known whether these effects on fertility are reversible [see Adverse Reactions (6) Clinical Pharmacology (12.2), Nonclinical Pharmacology (13.1)]. The safety and efficacy of DEMEROL Injection in patients less than 18 years of age have not been established. The safety and effectiveness of meperidine in pediatric patients has not been established. Literature reports indicate that meperidine has a slower elimination rate in neonates and young infants compared to older children and adults. Neonates and young infants may also be more susceptible to the effects, especially the respiratory depressant effects. If meperidine use is contemplated in neonates or young infants, any potential benefits of the drug need to be weighed against the relative risk of the patient. Elderly patients (aged 65 years or older) may have increased sensitivity to meperidine. In general, use caution when selecting a dosage for an elderly patient, usually starting at the low end of the dosing range, reflecting the greater frequency of decreased hepatic, renal, or cardiac function and of concomitant disease or other drug therapy. Respiratory depression is the chief risk for elderly patients treated with opioids, and has occurred after large initial doses were administered to patients who were not opioid-tolerant or when opioids were co-administered with other agents that depress respiration. Titrate the dosage of DEMEROL Injection slowly in geriatric patients and monitor closely for signs of central nervous system and respiratory depression [see Warnings and Precautions (5.2)]. Meperidine is known to be substantially excreted by the kidney, and the risk of adverse reactions to this drug may be greater in patients with impaired renal function. Because elderly patients are more likely to have decreased renal function, care should be taken in dose selection, and it may be useful to monitor renal function. Accumulation of meperidine and/or its active metabolite, normeperidine, can also occur in patients with hepatic impairment. Elevated serum levels have been reported to cause central nervous system excitatory effects. Meperidine should therefore be used with caution in patients with hepatic impairment. Titrate the dosage of DEMEROL Injection slowly in patients with hepatic impairment and monitor closely for signs of central nervous system and respiratory depression. Accumulation of meperidine and/or its active metabolite, normeperidine, can occur in patients with renal impairment. Meperidine should therefore be used with caution in patients with renal impairment. Titrate the dosage of DEMEROL Injection slowly in patients with renal impairment and monitor closely for signs of central nervous system and respiratory depression. 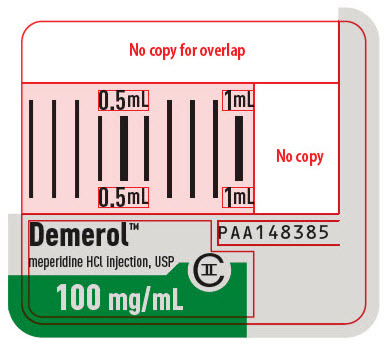 DEMEROL Injection contains meperidine, a Schedule II controlled substance. 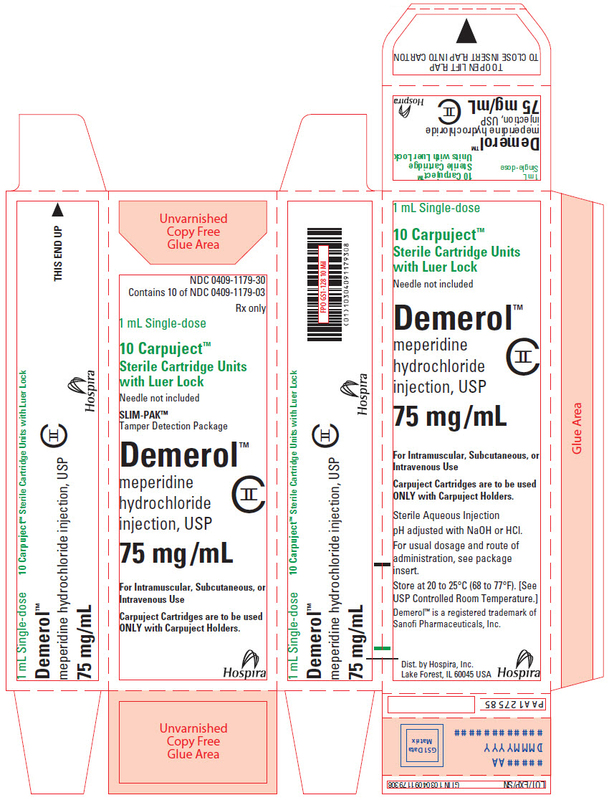 DEMEROL Injection contains meperidine, a substance with a high potential for abuse similar to other opioids including fentanyl, hydrocodone, hydromorphone, methadone, morphine, oxycodone, oxymorphone, and tapentadol. 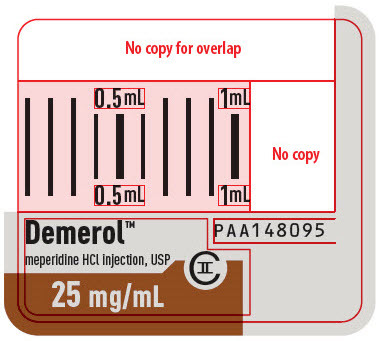 DEMEROL Injection can be abused and is subject to misuse, addiction, and criminal diversion [see Warnings and Precautions (5.1)]. DEMEROL Injection, like other opioids, can be diverted for non-medical use into illicit channels of distribution. Careful record-keeping of prescribing information, including quantity, frequency, and renewal requests, as required by state and federal law, is strongly advised. 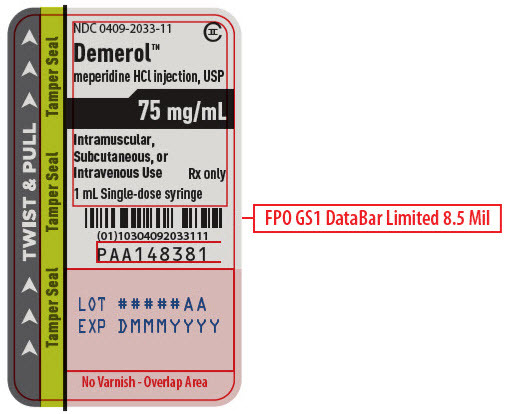 Abuse of DEMEROL Injection poses a risk of overdose and death. The risk is increased with concurrent abuse of DEMEROL Injection with alcohol and other central nervous system depressants. DEMEROL Injection should not be abruptly discontinued [see Dosage and Administration (2.4)]. If DEMEROL Injection is abruptly discontinued in a physically-dependent patient, a withdrawal syndrome may occur. Some or all of the following can characterize this syndrome: restlessness, lacrimation, rhinorrhea, yawning, perspiration, chills, myalgia, and mydriasis. Other signs and symptoms also may develop, including: irritability, anxiety, backache, joint pain, weakness, abdominal cramps, insomnia, nausea, anorexia, vomiting, diarrhea, or increased blood pressure, respiratory rate, or heart rate. 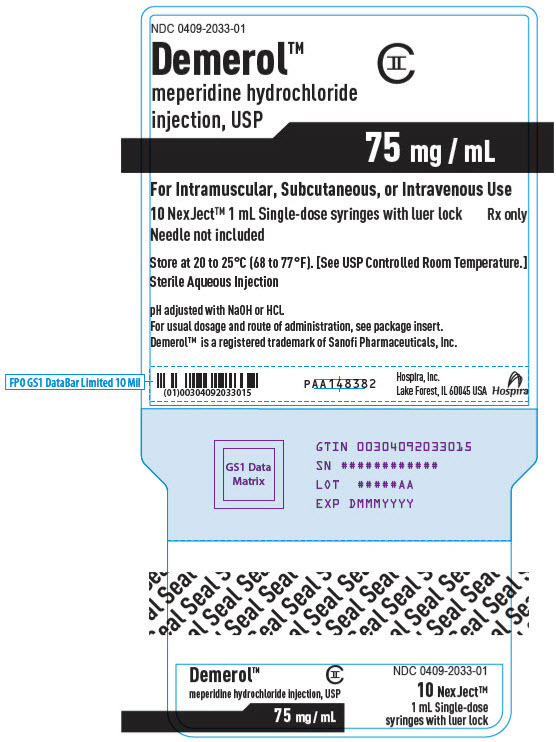 Acute overdose with DEMEROL Injection can be manifested by respiratory depression, somnolence progressing to stupor or coma, skeletal muscle flaccidity, cold and clammy skin, constricted pupils, and, in some cases, pulmonary edema, bradycardia, hypotension, partial or complete airway obstruction, atypical snoring, and death. Marked mydriasis rather than miosis may be seen with hypoxia in overdose situations [see Clinical Pharmacology (12.2)]. In severe overdose, particularly by the intravenous route, apnea, circulatory collapse, cardiac arrest, and death may occur. Accumulation of normeperidine as in chronic use or possibly following introduction of a concomitant CYP3A4 inducer presents as excitatory syndrome including hallucinations, tremors, muscle twitches, dilated pupils, hyperactive reflexes, and convulsions. The opioid antagonists, naloxone or nalmefene, are specific antidotes to respiratory depression resulting from opioid overdose. For clinically significant respiratory or circulatory depression secondary to meperidine overdose, administer an opioid antagonist. Opioid antagonists should not be administered in the absence of clinically significant respiratory or circulatory depression secondary to meperidine overdose. Because the duration of opioid reversal is expected to be less than the duration of action of meperidine in DEMEROL Injection, carefully monitor the patient until spontaneous respiration is reliably re-established. If the response to an opioid antagonist is suboptimal or only brief in nature, administer additional antagonist as directed by the product's prescribing information. DEMEROL (meperidine hydrochloride, USP) Injection is an opioid agonist, available for intramuscular, intravenous, or subcutaneous administration. The chemical name is 4-Piperidinecarboxylic acid, 1-methyl-4-phenyl-,ethyl ester, hydrochloride. The molecular weight is 283,80. Its molecular formula is C15H21NO2âˆ™HCl, and it has the following chemical structure. Meperidine hydrochloride is a white crystalline substance with a melting point of 186° C to 189° C. It is readily soluble in water and has a neutral reaction and a slightly bitter taste. The solution is not decomposed by a short period of boiling. 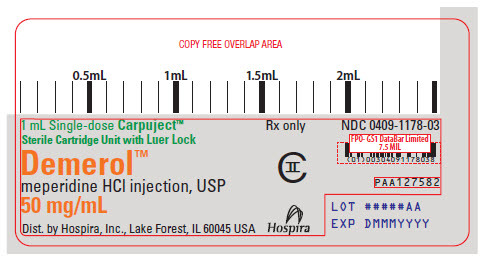 DEMEROL INJECTION is available as Injectable, Carpuject Single-dose cartridge with Luer Lock for the Carpuject Syringe System: 25 mg/mL, 50 mg/mL, 75 mg/mL, and 100 mg/mL. The pH of DEMEROL Injection solutions is adjusted between 3.5 and 6 with sodium hydroxide or hydrochloric acid. DEMEROL Injection, brand of meperidine hydrochloride, 5 percent solution has a specific gravity of 1.0086 at 20°C and 10 percent solution, a specific gravity of 1.0165 at 20°C. Meperidine hydrochloride is an opioid agonist with multiple actions qualitatively similar to those of morphine; the most prominent of these involve the central nervous system and organs composed of smooth muscle. The principal actions of therapeutic value are analgesia and sedation. Meperidine produces respiratory depression by direct action on brain stem respiratory centers. The respiratory depression involves a reduction in the responsiveness of the brain stem respiratory centers to both increases in carbon dioxide tension and electrical stimulation. Meperidine causes miosis, even in total darkness. Pinpoint pupils are a sign of opioid overdose but are not pathognomonic (e.g., pontine lesions of hemorrhagic or ischemic origins may produce similar findings). Marked mydriasis rather than miosis may be seen due to hypoxia in overdose situations. Meperidine causes a reduction in motility associated with an increase in smooth muscle tone in the antrum of the stomach duodenum. Digestion of food in the small intestine is delayed and propulsive contractions are decreased. Propulsive peristaltic waves in the colon are decreased, while tone may be increased to the point of spasm, resulting in constipation. Other opioid-induced effects may include a reduction in biliary and pancreatic secretions, spasm of sphincter of Oddi, and transient elevations in serum amylase. Meperidine produces peripheral vasodilation which may result in orthostatic hypotension or syncope. Manifestations of histamine release and/or peripheral vasodilation may include pruritus, flushing, red eyes, and sweating and/or orthostatic hypotension. Opioids inhibit the secretion of adrenocorticotropic hormone (ACTH), cortisol, and luteinizing hormones (LH) in humans [see Adverse Reactions (6)]. They also stimulate prolactin, growth hormone (GH) secretion, and pancreatic secretion of insulin and glucagon. The minimum effective analgesic concentration will vary widely among patients, especially among patients who have been previously treated with potent agonist opioids. The minimum effective analgesic concentration of meperidine for any individual patient may increase over time due to an increase in pain, the development of a new pain syndrome and/or the development of analgesic tolerance [see Dosage and Administration (2.1, 2.3)]. Meperidine, in 60 mg to 80 mg parenteral doses, is approximately equivalent in analgesic effect to 10 mg of morphine. The onset of action is slightly more rapid than with morphine, and the duration of action is slightly shorter. Meperidine is significantly less effective by the oral than by the parenteral route, but the exact ratio of oral to parenteral effectiveness is unknown. There is a relationship between increasing meperidine plasma concentration and increasing frequency of dose-related opioid adverse reactions such as nausea, vomiting, CNS effects, and respiratory depression. In opioid-tolerant patients, the situation may be altered by the development of tolerance to opioid-related adverse reactions [see Dosage and Administration (2.1, 2.3)]. The half-life of meperidine is 2 to 5 hours, and the half-life of normeperidine is 15 to 30 hours. Meperidine is metabolized through biotransformation. In vitro data show meperidine is metabolized to normeperidine in liver mainly by CYP3A4 and CYP2B6. The elimination half-life is 3 to 8 hours in healthy volunteers and is 1.3 to 2 times greater in post-operative or cirrhotic patients. Meperidine and normeperidine are excreted by kidneys. In clinical studies reported in the literature, changes in several pharmacokinetic parameters with increasing age have been observed. The initial volume of distribution and steady-state volume of distribution may be higher in elderly patients than in younger patients. The free fraction of meperidine in plasma may be higher in patients over 45 years of age than in younger patients. Phenytoin: The hepatic metabolism of meperidine may be enhanced by phenytoin. Concomitant administration resulted in reduced half-life and bioavailability with increased clearance of meperidine in healthy subjects; however, blood concentrations of normeperidine were increased [see Drug Interactions (7)]. Ritonavir: Plasma concentrations of the active metabolite normeperidine may be increased by ritonavir [see Drug Interactions (7)]. Acyclovir: Plasma concentrations of meperidine and its metabolite, normeperidine, may be increased by acyclovir [see Drug Interactions (7)]. Cimetidine: Cimetidine reduced the clearance and volume of distribution of meperidine and also the formation of the metabolite, normeperidine, in healthy subjects [see Drug Interactions (7)]. Long-term studies in animals to evaluate the carcinogenic potential of meperidine have not been conducted. Studies in animals to evaluate the mutagenic potential of meperidine have not been conducted. Studies to determine the effect of meperidine on fertility have not been conducted. Carpuject are packaged in a Slim-Pak tamper detection package. Note that a needle is not included. 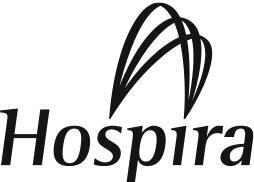 DEMEROL is not a trademark of Hospira. Inform patients that opioids could cause a rare but potentially life-threatening condition resulting from concomitant administration of serotonergic drugs. Warn patients of the symptoms of serotonin syndrome and to seek medical attention right away if symptoms develop. Instruct patients to inform their health care provider if they are taking, or plan to take serotonergic medications [see Warnings and Precautions (5.7), Drug Interactions (7)].